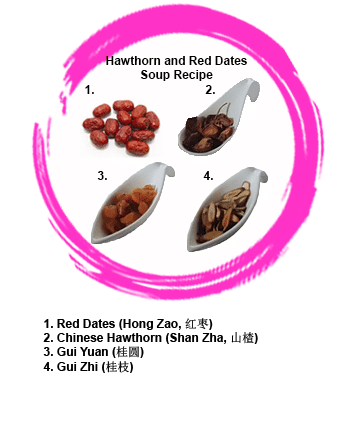 The Hawthorn and red dates soup (山楂红枣补血汤) can be cooked at week 2 of your confinement month. 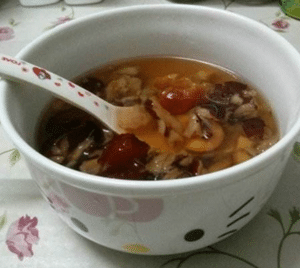 If you did not engage a confinement nanny or meals delivery, you may want to try this soup. The main function of the soup is to tonify blood, clear blood stasis and meridians. Please note that it is not recommended to use red date with sulphites. Wash red dates, cut into halves and remove stones. Wash herbs, soak in 1000ml water for 30 min. Bring herbs and water to boil. Reduce heat and simmer for 30min. Add brown sugar before serving.